Crystal Gayle in concert, 2008. Gayle continued having major country pop success from the late 1970s and through late 1980s. Her biggest hits included "Ready for the Times to Get Better" (1977), "Talking in Your Sleep" (1978), "Half the Way" (1979), "You and I" (1982), and "The Sound of Goodbye" (1984). In 1982, Gayle collaborated with Tom Waits on the soundtrack for Francis Ford Coppola's film One from the Heart. In the mid 1980s she and Gary Morris recorded the theme song for Another World and would appear in several of the show's episodes. Throughout the 1990s Gayle shifted artistic directions by recording various genres of music. This included an album of inspirational music entitled Someday (1995) and an album of standards called Crystal Gayle Sings the Heart and Soul of Hoagy Carmichael (1999). During the decade she also owned and operated a fine arts shop called "Crystal's Fine Gifts and Jewelry". Her last studio album appeared in 2003 and Gayle has since continued to tour throughout the world. Gayle has won one Grammy Award and has been nominated for several others since the 1970s. She has also won five Academy of Country Music awards; those awards include receiving the Cliffie Stone Pioneer Award in 2016. In addition, she has won two Country Music Association awards and three American Music Awards. Rolling Stone ranked her among the 100 greatest country artists of all time and CMT ranked her within their list of the 40 greatest women of country music. Gayle has her own star on the Hollywood Walk of Fame and was inducted as a member of the Grand Ole Opry in 2017. 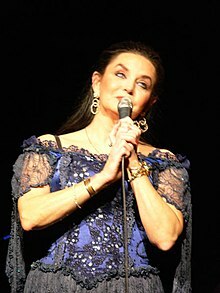 Crystal Gayle was born Brenda Gail Webb on January 9, 1951, in Paintsville, Kentucky. She is the fourth daughter and last child of eight born to Clara Marie "Clary" (née Ramey; 1912 – 1981) and Melvin Theodore "Ted" Webb (1906 – 1959). Mr. Webb was a coal miner and subsistence farmer. Gayle released a new recording of a previously recorded album track from her album Crystal as her follow up single to "Don't It Make My Brown Eyes Blue". Although the single, "Ready for the Times to Get Better", became her fourth number-one Country hit, it failed to reach the Pop Top 40 (number 52). Gayle's next album, When I Dream, yielded three Top 3 Country hits – the No. 1 songs "Talking in Your Sleep" and "Why Have You Left the One You Left Me For" as well as the number 3 title track. "Talking In Your Sleep" returned Gayle to the pop Top 20 (number 18). Gayle left United Artists for Columbia Records in 1979 for her next album, Miss the Mississippi. She returned again to the pop Top 20 with that album's first single, "Half the Way" (number 15 pop, number 2 country, number 9 adult contemporary) which became her last solo Top-20 pop hit. Gayle also appeared in the second episode of the fourth season of The Muppet Show. "Another World" became Gayle's last Top 10 country hit to date. As traditional country singers such as Randy Travis and the Judds began to dominate the country airwaves in the late 1980s, the success of crossover artists like Gayle began to wane. Gayle's final top 25 single was the title track from 1988's Nobody's Angel album (No. 22); her last charted single was a cover of the Delaney & Bonnie song "Never Ending Song of Love" (number 72) in 1990. Gayle also sang the theme song for the short-lived 1983 television series Masquerade, the theme song having the same title as the series. As of December 2016, Gayle was working on a new album, her first in 13 years. She stated that the album would be covers of country music classics and would be produced by her son, Chris, who has produced albums for numerous other country artists in the past. The project was titled Am I That Easy To Forget. ^ a b c d "Crystal Gayle - Biography & History". AllMusic. Retrieved February 11, 2019. ^ a b "Country Music – Music News, New Songs, Videos, Music Shows and Playlists from CMT". Cmt.com. Retrieved February 11, 2019.